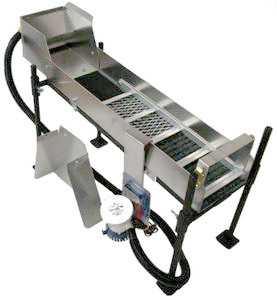 This 6 inch Power Sluice Setup Kit includes a 32" long x 6" wide sluice with 3 inch high sides, and an 8" x 6" x 6" header box, flare, an 8.5" x 24" sluice stand with legs, a 12 volt 800-gph pump, and 4 feet of 3/4" hose. Made in the USA! It is made out of strong .080 gauge 5052 aircraft aluminum, which is light weight - plus, aluminum makes it easier to use a magnet to remove the black sand build up. The unique elongated 45 degree z-riffles are great for trapping gold. The riffle cage is also aluminum. Up front in the bottom of the sluice is ribbed black matting for fast gold ID, followed by expanded metal over miner's carpet. The expanded metal helps keeps the gold in the box and prevents the rocks from knocking it loose. This 6" power sluice header box setup and the 800-gph 12-volt pump all adds up to a good high volume power sluice, especially when you need something small and portable that weighs only about 14 pounds (shipping weight). It can also be used with a recovery tub (not included) to complete a power sluice recirculating system. This unit can be used as a sluice or a highbanker. Looking for something larger? Check out the 10 inch Power Sluice and Set Up Kit.